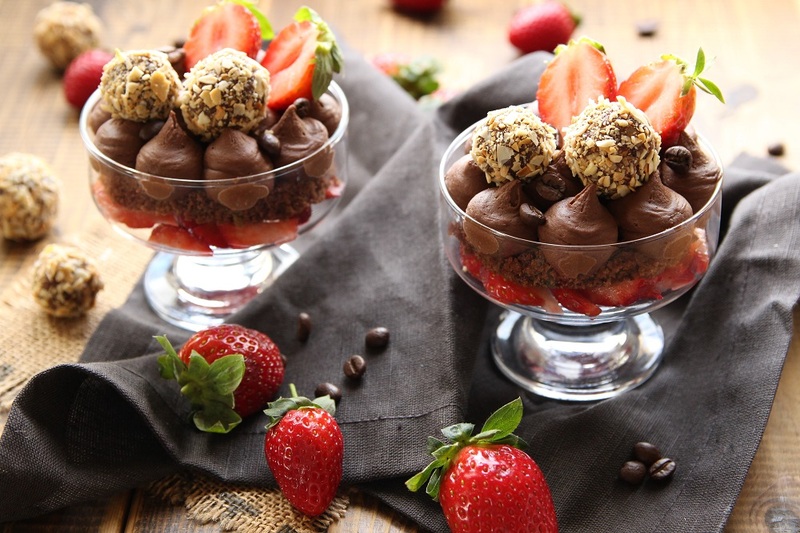 Valentine’s Day is just around the corner, and whether you celebrate it or simply want an excuse to indulge in some chocolate, strawberry goodness, this vegan chocolate dessert is just the treat for you! This chocolate dessert is filled with freshly chopped strawberries, a layer of chocolate sponge cake, and some whipped coffee infused chocolate ganache. Then, if that isn’t already enough, I decorated the dishes with halved strawberries, coffee beans, and my addictive chocolate bliss balls. 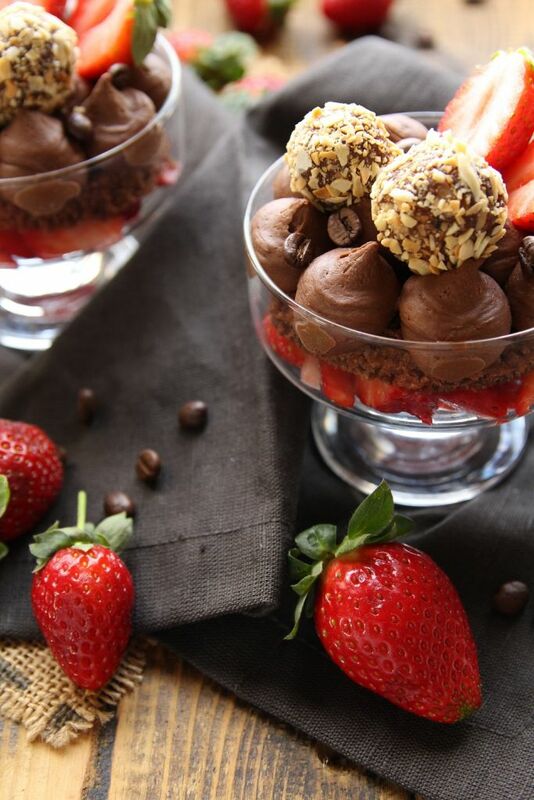 Not only does this chocolate packed treat perfectly fall into the category of Valentine’s Day desserts, (chocolate, cream, and strawberries) it’s also a quick fix for those lazy weekends, bad days, or deep chocolate cravings… It’s the answer to so many problems! 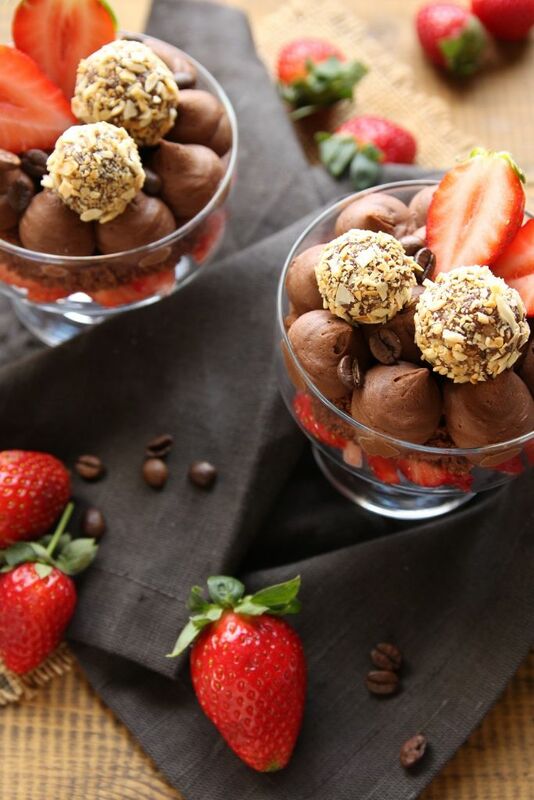 So, cuddle up with your loved one, and indulge in these individual bowls filled with nothing but pure chocolate goodness, and a few strawberries! First prepare the chocolate ganache. Place the chocolate into a heat proof bowl and set aside. Place the coconut milk and instant coffee into a small pot and almost bring to a boil. Pour the coconut milk into the chocolate bowl and let it rest for a minute before stirring. Finally, mix until smooth, and transfer to the fridge to chill. Place the wet ingredients in one bowl and the dry ingredients in another bowl. Whisk each bowl separately until combined, then add the dry ingredients in with the wet and whisk until smooth. Next, pour the mixture into a lightly greased 5 inch (12 cm) round cake tin and pop into the oven for 10 to 15 minutes, or until a toothpick comes out almost clean. Remember, each oven is different so keep an eye out. When ready, take your cake out of the oven to completely cool before you proceed. Wash and dry the strawberries, reserve 2 strawberries, and cut the rest into long thin strips, removing and discarding the top green portion. Evenly divide the sliced strawberries into 2 dishes. Horizontally cut the cake in half and place on top of the strawberries. Once the ganache has completely cooled down, take it out of the fridge and briefly whip it with a whisk or electric hand-held blender, to fluff it out. Make sure not to over mix, but if you do it’s not the end of the world. Finally, evenly pipe or scoop the ganache onto each chocolate cake sponge, decorate with the remaining strawberries, my chocolate bliss balls, some optional coffee beans, and dig in! 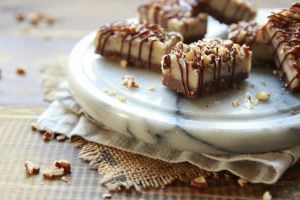 Next time try my No Bake Pecan Bars. ← Easy Vegan Miso Soup In 20 Minutes! Can I sub equal parts of agave syrup for the maple syrup in the cake recipe? And if we aren’t gluten free per say…I have gf flour but not baking powder — can I use “regular ‘ol” baking powder? Same amount as listed? I haven’t tried it with agave syrup, but don’t see why it wouldn’t work. As for the baking powder, you can use regular baking powder. You can use regular flour or my gluten free flour blend. I have baked this cake many times with spelt flour. This looks amazing, thanks for making it gluten free! Strawberries just came into season too. I really want to try it, just got to get my hands on a digital scale. Thanks for linking back to my page.